Stay ahead of the curve in a competitive tax preparation environment with this course covering all of the essential developments impacting individual tax returns during the upcoming filing season. 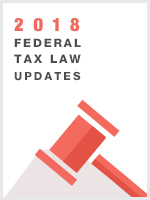 Important tax law updates include an analysis of the extender and Affordable Care Act provisions, as well as a discussion of the personal exemption and itemized deduction phase-outs. This course also includes a review of basic individual tax preparation information needed to prepare 2018 returns and tackles some of the most challenging areas for preparers, such as determining entitlement to dependency exemptions for divorced and unmarried parents, the various methods of interest income reporting, and utilizing valuable education credits. Foreign account reporting is discussed, as is the problem of tax related identity theft. Practices, procedures, and professional responsibility requirements mandated by Circular 230 are covered to equip the practitioner with the relevant information needed to complete a successful 2018 filing season. The course content is provided in a lively fashion focusing on real-world solutions to common tax preparation problems and is replete with examples and illustrations demonstrating how to apply the relevant rules. Expiration: In accordance with IRS policies, access to this course will terminate at the end of the year. Incomplete courses will no longer be accessible or reportable to the IRS beyond the end of the year deadline.